There are now questions circulating about. Did nerves leave the actress rambling and unguarded? Was she not really thinking? Or does she actually believe that gay and civil rights are segregated from feminism? It all sounds very second wave feminism, void of any thought regarding intersectional oppressions. And though it may be frustrating to hear privileged, rich, white women talk about oppression, actresses like Arquette and Emma Watson are celebrities who many look up to—whose words are taken to heart. Their words can lead others to take baby steps to feminism. Even fumbles like Arquette’s pressroom comments can be a jumping off point for discussions on gender equity and intersectionality. 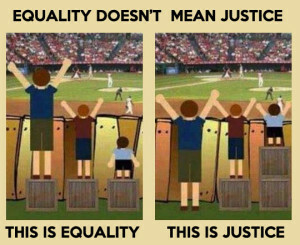 When talking about injustice, the word “equality” is often used in defining justice. Emma Watson used the term in her speech to the UN last September, and many other well-meaning folks do as well. But, equality operates on the idea that everyone is starting from the same place. That’s just not the case when it comes to gender discrimination and pay. Women of colour, Indigenous women and women with disabilities, for example, face barriers white able women do not—there is still a mainstream default ideal, which is based on whiteness, heterosexuality, middle-class status and having an able body. It is well documented that women in higher-up positions, such as CEOs, make less than their male counterparts. It is also known that women are hired more for part-time work. Since the dominant gender norms dictate that women are the caregivers, mothers take the pay hit, whether it be in daycare fees or part-time work, as well as low maternity leave pay. Even for women without children, the mere possibility that they could get pregnant lessens their chances of being hired, among a list of other tired and sexist excuses. Equity would first create fairness for all people. Access to the same opportunities needs to be made before moving on to equality as the ideal. But there are so many overlapping factors regarding oppression. Race, class, religion, sexuality, ability, language, family, gender, and on and on. White, heterosexual, rich women do not own feminism. Looking at Arquette’s comments, she seems to have forgotten that there are women of colour and gay women, or the fact that civil and gay rights have not yet been achieved. I want to give the actress the benefit of the doubt; I want to be happy that feminism is being brought into the mainstream. Earlier today she Tweeted, “The working poor women of this country have been asking for help for decades. If I have “privilege”* or a voice I will shine light on them.” Hopefully those who were enlightened to feminism through Arquette’s speech will join the discussions about intersectionality so that these same mistakes won’t be made again. *The reluctance of those with any privilege admitting that they have privilege is a whole other post.